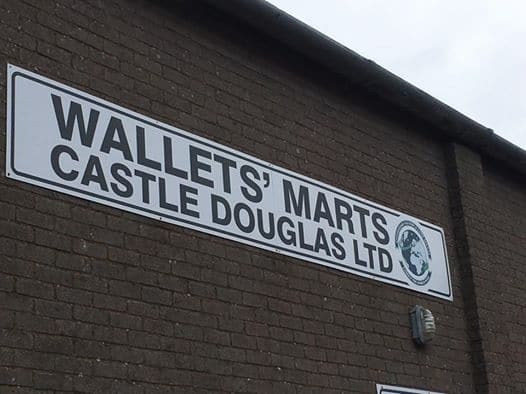 Wallets Marts Castle Douglas Limited continued their fortnightly sales on Monday 8th April 2019 when they sold 898 Store and OTM Cattle. With a greatly increased entry forward a busy ringside of bidders were present resulting in a very successful days trading for everyone involved. The recent flush of grass and firming of beef prices ensured a more positive approach by all concerned. All classes of cattle met a strong demand topping at £1260 for a pen of Limousin bullocks from Messrs Robb, Trolane, Dalry. Top price per kg was 279.6p paid to Messrs Davidson, Poldean for a pen of eight Charolais bullocks. Poldean sold 29 bullocks to average 277.1p per kg. The heifer section topped at £1180 for a pen of Charolais crosses from Messrs McHarrie, High Glenjorrie and 271.4p per kg for an outstanding South Devon heifers from Messrs N & J Newbould & Son, Meikle Cloak, Dalbeattie. Numbers were well short of buyers requirements in the OTM when 29 cattle met a seriously competitive trade topping at £1098.92 or 160p per kg for a Limousin cross cow from Messrs Wright, West Balscalloch. Overage heifers sold to 160p fpr an AAx from RKG Farms, Irelandton whilst cast bulls sold to 110p per kg for a Luing from Messrs Stewart, High Ardwell. Overall average was 136.59p per kg.